What comes to the mind when thinking about Banten Province? Most of the time, it is related to various types of vacation destinations. It doesn’t have to be beaches, mountains, historical sites, and lakes. Banten also becomes the home of stunning islands. One of them is Merak Kecil Island. The name comes from the region where the island is included. It is about 1 km from Merak Port, actually. You can reach it using a motorboat from such port. Apart from being a tourist destination, the island becomes a natural border to prevent huge waves from entering Merak Port. Once you get on the island, there is only a serene nuance. No wonder, it is an uninhabited island. Due to this fact, tourists can relax and enjoy the nature wholeheartedly. The best feature in the island is the trees and bushes. Somehow, they create a calming atmosphere. Next, it features white and soft sand. In terms of waves, the seawater is quite calm and warm. It is hard to refuse the swimming temptation. You can simply site and witness some local boats passing by. What a wonderful nuance! What can people do in Merak Kecil Island? Most of the time, it is about relaxation. The most popular time to visit the island is during holidays. Some visitors want to spend a New Year in this location, too. They are the locals who live nearby. When it comes to the activities, beach walking is a recommended choice. Due to soft sand, you can walk on it comfortably. The best scenery is the fishermen’s boats. They pass through the island looking for fishes. The next activity is photography. Even though the size of the island is small, it features beautiful objects. These things can be wonderful photography objects, for sure. If necessary, you need to come with your friends. This way, you can take selfies with them. If you come with your kids, make sure to supervise them well. It is because the water is deep. The children are allowed to play in the shoreline as long as you watch them carefully. Thus, don’t let them get too close to the water. What about swimming? As mentioned earlier, it is a possible thing to do in Merak Kecil Island. The water is warm, in fact. However, you must be careful with the waves. In some occasions, they are quite strong. Next, it is the boat riding. If you are lucky, you are allowed to ride the local fishermen’s boat. It doesn’t even cost anything. That means you can ride it freely. In this case, what you need is good communication skills. 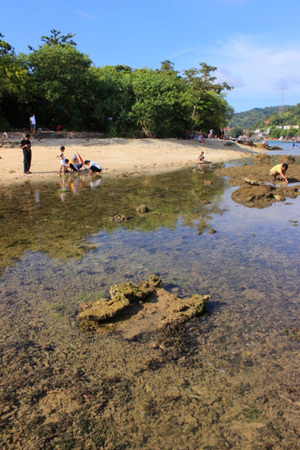 Merak Kecil Island is situated in Mekarsari Sub-district, Pulomerak District of Cilegon City. If you come from Jakarta, your prime destination is Merak Port. The trip may take about 2-3 hours and the distance is 127 km. It is better to take Pantura Street and head to Tangerang-Merak Freeway. It is considered the fastest route. Once you reach Merak Port, you can simply cross the sea using a boat. It takes approximately 10 minutes. Enjoy your trip!